Welcome to your new home, Donald. I died in this house and cannot leave, and so shall it be with you and your family. A treat (not a trick!) awaits horror fans on Amazon over the next few days. 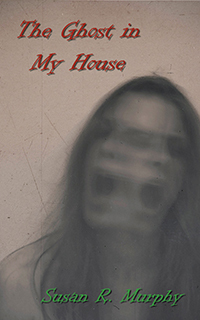 The Ghost in My House is a short story by Susan R. Murphy that has just been published in Kindle edition and is on sale now. All this weekend and right through Halloween, readers can download it for free as part of a special Kindle promotion. The offer ends at the stroke of midnight on 31 October – the Eve of All Hallows – when, as tradition tells us, ghosts and ghouls return to their unearthly realm. The Ghost in My House is, as the title would suggest, a ghost story on a haunted house theme. Donny, together with his mom and dad and his sister, Tiffany, move into a new home – a small house in Lincoln Acres, part of National City in San Diego. At first, it seems like everything that they could ask for but quickly, they realise that they are not alone. A gruesome murder took place in the house many years before, and the victim is still crying out for revenge. While it may sound like familiar territory for horror fans and aficionados nevertheless, it is Susan's distinctive storytelling style that will keep you glued, right to the end. Her previous book, The Immortals (published in 2014) is a collection of short stories that have been described as "very, very scary"! Her writing reflects themes and preoccupations with horror, sci-fi, romance, legends and re-interpretations of tales from ancient Greek mythology. The Ghost in My House by Susan R. Murphy is published by The Manuscript Publisher. It is available to buy online, in Kindle edition through Amazon.